Christian Kurds have a long history although their number is very small now. They enjoy religious freedom in Rojava and KRG, but still oppressed by Turkish and Iranian states. First religious propagation of the Kurds to Christianity in Kurdish terrains is dated to the main Century A.D by Apostle Andrew. In the year 338 AD, a Kurdish ruler named Tirdad became Christian. It has been estimated that he was from the Hawraman locale of Kurdistan. As per a legeng, some “sun-worshipping” Kurds were converted to Christianity after a Greek priest, cleric and St. Mar Saba (439–532) who achieved to convert them amid the fifth century. As a result of Islamic conquest of Kurdish regions, majority of the Kurds were forced to convert to Islam. The Christians who are “People of the Book” in Islamic Law were not persecuted as long as they paid Islamic Jizya Tax. But nothing could stop the decrease of Kurdish Christian population. Some Muslim Kurds converted to Christianity even in a time of Islamic dominance. In 9th century, Nasr the Kurd converted to Christianity and changed his name to Theophobos. He became a very good friend and top commander of Emperor Theophilus. In 10th century, Ibn ad-Dahhak, a Kurdish ruler left Islam and entered Orthodox Christianity. In the period between 11th and 12th centuries, Kurdish Christian soldiers made up 2.7% of the army of fortress city of Shayzar in modern-day Syria. Since the Islamic conquest of Kurdistan, Christian Kurds isolated from the Muslim majority then developed better relations with non-Kurdish Christians such as Armenians, Georgians and Arameans. The ancestors of Armenian ruler family Zakarids and Georgian Zakaridze & Mkhargrzeli families were Kurdish. Most of the Christian Kurds adopted Aramaic because it was the church language of most of Middle Eastern Christians. Some Nestorians, who consider themselves Assyrian today, are partially of Kurdish origin. Kurdish converts to Christianity usually became members of Nestorian Church. Many Christian Kurds who spoke only Kurdish had to leave Kurdistan along with Armenians and Greeks. By the end of 2000, evangelical Kurdzman (Kurdish-speaking) Church of Christ was founded in Erbil, capital of KRG. It has branches in the provinces of Sulaymaniyah and Duhok. 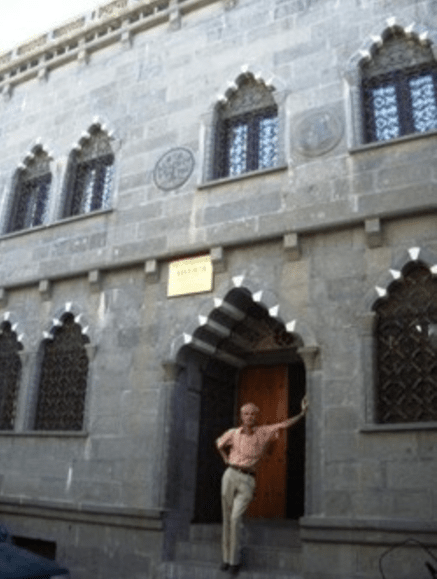 There is a Protestant church in Diyarbakır, the unofficial capital of Turkish-occupied Kurdistan. Although Pastor Ahmet Güvener is ex-Alevi Turkmen, his followers are Kurds who are mostly recent converts. Theophobos and Ibn al Dahhak were renowned Christian Kurds in history. In 1931, Sheikh Ahmed Barzani, uncle of Masoud Barzani declared that he was a Christian. There is a legend that Molla Mustafa Barzani’s ancestors were Nestorians who emigrated from Siirt Province in Turkish-occupied Kurdistan. Some sources claim that Lebanese writer and poet Khalil Gibran was an assimilated Kurd. Vizantija i araby by A. Vasilyev, 1902, p. 220.